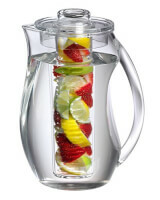 Adding fresh fruit to your favorite summertime beverages has never been easier! Keep chilled, refreshing lemonade, raspberry iced tea, lime-infused water and more on hand to enjoy any time. Perfect for getting through the long, hot summer. Hand blown crystal clear borosilicate glass. Individually packaged in a colorful giftbox. 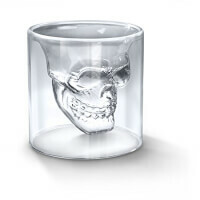 Fun and Easy to use.Holds 2.5 ounces. Great addition to dad's messy work space - even if dad's work space is clean, most likely the keyboard is messy :) Ultra-durable: Built to take a washing and pounding - durable keys with laser printing and UV coating. Top rated. 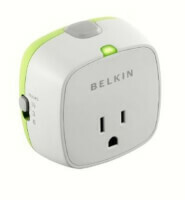 Automatically shut off power after charging is complete. Great for phones, iPads, electronic toothbrush, coffee maker and anything else around the house. Conserve energy and improve the life of your electronic devices. Great gift for guys. 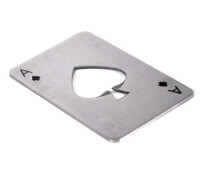 Great addition to any poker game, game night or barbeque. Made from heavy duty stainless steel with a slim style design that easily fits in the pocket. We had to add this one to the list. 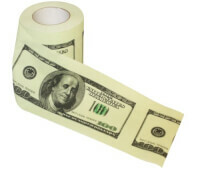 Is there any better way to make someone feel like a millionaire? Well, maybe there is. But this is good too ..... and funny. An ingenious way to utilize the space on your grill; these flexible, grilling skewers, made of 100% stainless steel let you twist, turn, and loop your kebabs around other food on the grill. Each 31 inch Fire Wire skewer holds twice as much food as a standard skewer. 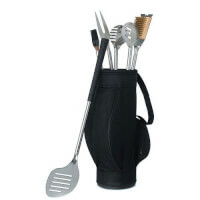 Your fairway friends will get a kick out of this five-piece barbecue golf-themed barbecue tool set. Complete with spatula, two-prong barbecue fork, grill brush, meat tenderizer and marinade brush, each sporting clever golf grip handles.